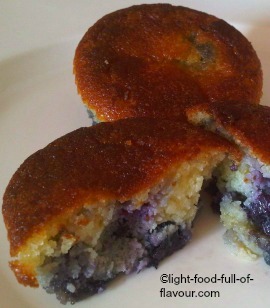 Believe it or not but these very moist and delicious gluten-free blueberry cakes are on the verge of being healthy! Blueberries are bursting with vitamins C and E - one large handful of the berries provides as many antioxidants as five servings of carrots, broccoli or apples. Berries in general contain many phytonutrients that boost your immune system. Fresh berries also have the lowest sugar content of all fruit – you can eat a big serving of berries without it affecting your weight very much. Almonds are known to lower bad cholesterol (I use ground almonds in this recipe). These nuts are a rich source of vitamin E and they also contain high quality protein and are rich in dietary fibre, B vitamins, essential minerals and monounsaturated fat. The sugar I use in all my cakes these days is xylitol. It is a vegetable sugar that looks and tastes like sugar but which has very little effect on raising your blood sugar. Xylitol has a really low GI – half that of fructose in fruit. I buy it in a health food shop. And when it comes to butter, well, nowadays a lot of health experts are saying that a little bit of butter in your diet does no harm and is much better for you than most manufactured spreads. 1. Pre-heat the oven to 180C/fan 160C/350F/gas mark 4. Line the holes of a muffin tin with medium-sized paper cases. 2. Place the butter and sugar in a bowl and using a whisk, cream together until light and fluffy. Add the eggs one at a time, whisking well after each egg. Mix together the ground almonds and baking powder and using a large spoon, fold it into the bowl with the butter, sugar and eggs. Stir in the milk, followed by the blueberries. 3. Divide the mixture between the paper cases and place the muffin tin in the oven. Bake for about 25 minutes. Leave the cakes to cool in the tin.